Nam Dinh (VNA) – Vice President Dang Thi Ngoc Thinh presented the title Hero of People’s Armed Forces in the period of the resistance war against French colonialism to Hai Hau district in the northern province of Nam Dinh during a ceremony marking the district’s 130th founding anniversary on August 26. Hai Hau, with its achievements during the past 130 years, can be considered an exemplary model for the entire country, the Vice President said. During the resistance war against French colonialism, over 9,800 locals in Hai Hau joined the army or volunteer forces to serve on battle fields. On April 26, 2018, President Tran Dai Quang decided to present the title Hero of People’s Armed Forces in the period of the resistance war against French colonialism to officials and people in Hai Hau. In 2015, Hai Hau became one of the first districts recognised as new-style rural areas in the country. The local economic growth reached 7.22 percent in 2017. The annual average per capita income was estimated at over 40 million VND (1,724 USD). The district has been selected to pilot the exemplary rural area model for sustainable development. 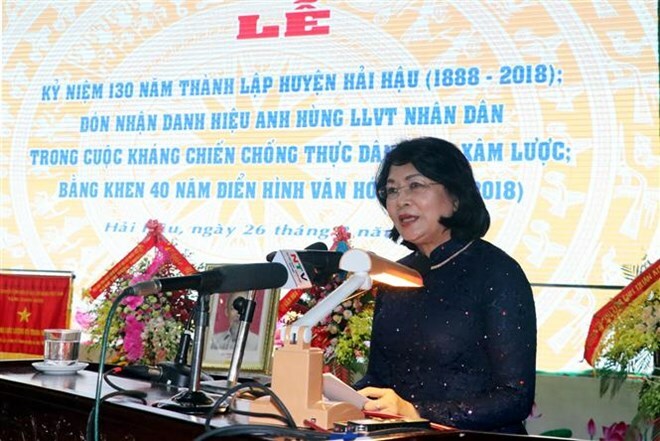 Vice President Dang Thi Ngoc Thinh urged the district to build on its revolutionary tradition and creativity to reap more achievements in the new period, especially when the country is stepping up modernisation and industrialisation to catch up with significant changes from the Fourth Industrial Revolution (Industry 4.0) and international integration. The district should focus on implementing effectively social welfare policies for national revolutionary contributors, eliminating poor households, and strengthening the all-people solidarity to obtain sustainable development, she suggested. At the same time, the district must pay special attention to the building of the Party and political system in addition to promoting patriotic emulation campaigns and developing rural areas.